ShareContacts: Share and synchronize Outlook Contacts. Share and synchronize Microsoft Outlook Contacts folders without a server. Group Address Book. Sync Outlook Contacts between PCs and share Contacts with colleagues or friends. If you are looking for a quick and easy way of sharing and synchronizing your Microsoft® Outlook® Contacts Folders with your coworkers and friends, this program is for you. You just need to install ShareContacts on your computer running Outlook 2002/2003/2007/2010/2013 and on computers of your preferred teammates, and after a few clicks your contact information will be updated each time you update the shared contacts folder. Your partner will receive the updated contact by regular e-mail. You are able to update and manage all your shared contacts offline or using Internet connection. It is an easy and effective solution for personal contacts synchronization, remote companies and groups. 7 Reasons to Buy ShareContacts and why it is better than Competitors' Products. Create, edit, and view your friends' or co-workers' contacts just as you do with your own. 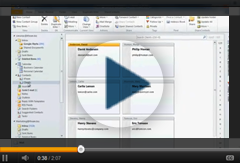 Create Outlook group (public) contacts folder. ShareContacts's Outlook group folders make group responding to support and sales e-mails easy, managing customers contacts more effective. Synchronize your personal Contacts folders with your second desktop or laptop, or allow your family and coworkers to subscribe (view only) to selected folders. Your Contacts will be always up to date. Create shared contacts folders and share them between different groups of people. A Company internal phone list, partners contact list, list of family members, etc. Sharing and syncing contacts data across different Outlook versions of 2002, 2003, 2007, 2010 or 2013 is not a problem. You don't need to worry what Microsoft Outlook version is installed on your second or your friend's PC. Create shared business contact folders, such as hotels, service stations, internal phone lists, etc. and allow your friends and important clients to subscribe to them. Each time you update items in your list, all its subscribers will receive them. It is easy to maintain the list of subscribers and its access rights. Your subscribers will receive the next version of ShareContacts subscription for free. Sharing, synchronizing and distributing custom Outlook forms of contacts between computers has never been easy. Especially with different Outlook versions. With ShareContacts, you can share folders with custom Outlook forms without any difficulty. ShareContacts will automatically publish your custom forms in shared Outlook Contact folders.